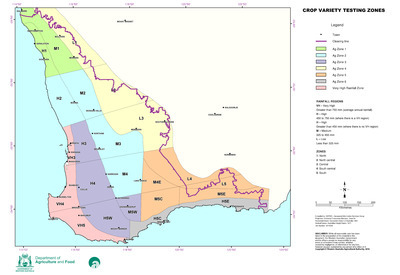 Crop variety testing (CVT) zones of the south west agricultural area of Western Australia showing the agricultural area, rainfall regions and Agzones. Geographic Information Services, D. (2016), Crop variety testing (CVT) zones of Western Australia. Department of Agriculture and Food, Western Australia, Perth. Map.